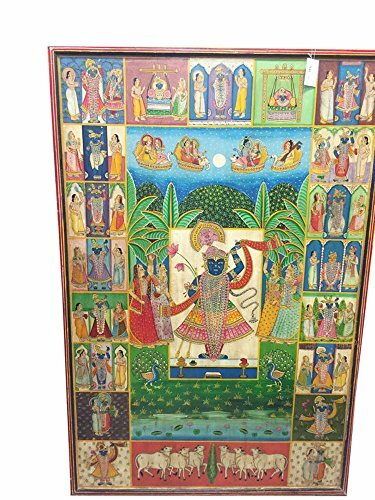 Mogul Pichhwai Krishna Colorful Artisan Painting Wall Panel Nathdwara "Door to the Lord" The icon of Shrinathji is specific as the deity symbolizes that form of Krishna, when he lifted the Govardhan hill. In the image, the lord is revealed with his left hand raised and the right hand made into a fist resting at the waist, with a large diamond placed beneath the lips. The idol is carved in Bas-relief out of a monolithic black marble stone, with images of two cows, one lion, one snake, two peacocks and one parrot engraved on it and three sages placed near it. The idol of Shrinathji wears exquisitely worked jewels, some dating back to pre-Mughal period. Shrinathji is adorned with intricately-woven shaneels and silk clothing having original zari and embroidery works. The Nathdwara temple is referred to as the Haveli, term used for the temple because it was situated in a fortified mansion, or Haveli, once a royal palace of the Sesodia Rajput rulers of Mewar. Pichhwai are intricate paintings which Shri Nathji, the child Krishna at 7 years of age. They exist in the holy town of Nathdwara in the Rajasthan state of India. (Nath - Lord, dwara - gate) meaning "the gates of the lord". Pichwai paintings are works of art that are used to adorn the walls of temples, behind the idol. ... Themes such as Raas Leela. Exterior Dimensions : 72 X 48 inch. If you have any questions about this product by Mogul Interior, contact us by completing and submitting the form below. If you are looking for a specif part number, please include it with your message.